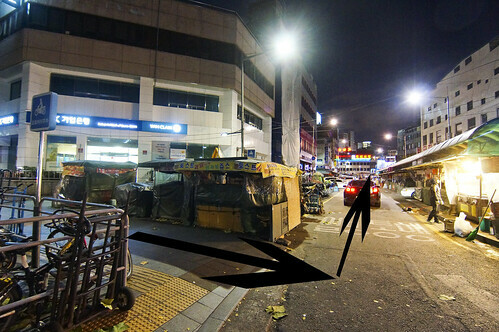 Jinokhwa Halmae Wonjo Dakhanmari is situated at an alley at Dongdaemun (동대문). They had been around for 35 years which goes a long way back when they first opened for business in year 1978. 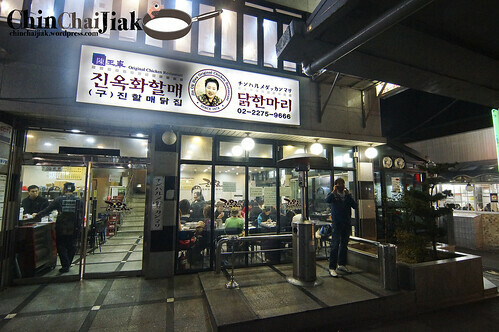 Among the few Dakhanmari restaurants in the same alley, Jinokhwa Halmae Wonjo Dakhanmari or Wonjo WonHalmae Dakhanmari are said to be the first Dakhanmari shop to start their business in this alley. Each Dakhanmari restaurant has their own loyal customer but Jinokkwa Halmae is said to be the only Dakhanmari restaurant that was featured in the Korean Michelin Guide in May of 2011. Dakhanmari, literally means ‘a whole chicken’ in English. It’s a Korean food that is not commonly found, or totally not available in Singapore. 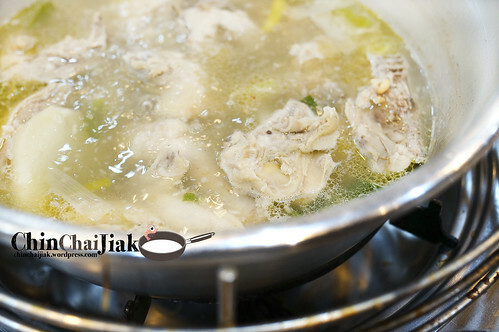 The 35 days old young chicken is cooked in Dakbaeksuk (Chicken Stew/Soup) whose recipe and ingredients are similar to Samgyetang (Ginseng Chicken Soup). 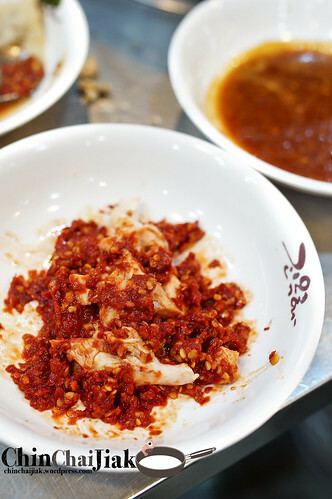 While Samgyetang is made with ginseng, various herbs, chestnuts, Dakbaeksuk consists of simpler ingredients, such as chicken, water, and garlic. I was very skeptical about Dakhanmari initially as the appearance of the food don’t look appealing, and even to a certain extend of scary looking. But there are really some talks about this on the net so I thought “what the heck, let’s do it”. In the end, this became one of the most interesting dining experience for my Seoul trip. I reached this place at about 9.00pm and i manage to get a table without a need to queue. Upon getting a table, there is no need for me to order anything as the waitress naturally placed a big pot of soup with half-boiled chicken on the stove and skilfully cut up the chicken with a pair of scissors. The flame was turned to high while I waited for the soup to boil in anticipation. 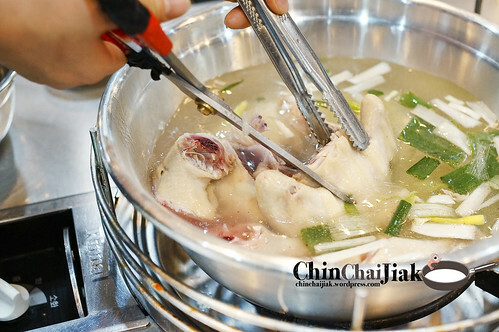 Oh, by the way, when the chicken is served, Jinokhwa Halmae had already sieved away the oil and grease and to remove any “chicken taste” during the initial boil so that is why the chicken is served half-boiled. While waiting for the soup to boil, i helped myself to the free-flow spicy Kimchi and water at the side counter. 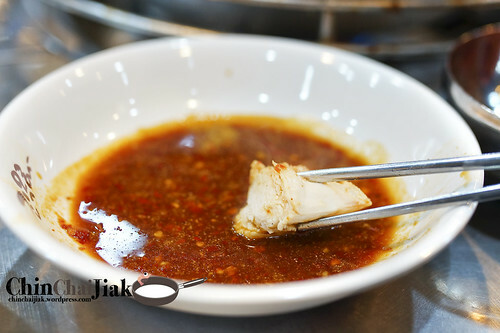 The waitress explained that the chicken is suppose to be dipped in a mixture of their condiments – soy sauce, spicy mustard and white vinegar (and chilli if you love spicy food). I personally think that dipping of the condiments is a must, else the chicken would only taste ordinary, like a typical steamed chicken. Rice cake and noodles can be added to the soup at W$1000 and W$1500 respectively. I didn’t opt to add any and the waitress seems very surprised. Maybe if anyone of you do, please share the experience with us. The unique thing about the soup is for it’s garlic chicken soup taste. There are three ways to enjoy Dakhanmari. First way is to eat it as it is. I thought it’s a little sad to just eat this as it is because it would be just Chicken and Soup and i might as well order a Ginseng Chicken Soup and Ginseng Chicken comes cheaper with more ingredients. 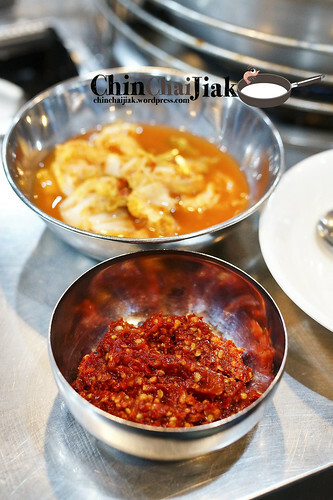 Second way is to add their hot pepper chilli into the soup to add more spicy flavour to it. I observed that the locals like to fill their plate with a whole plate of chilli and to mix it with the chicken meat like it’s some kind of gravy so i followed suit. LOL. The chilli taste a little bitter and salty which i personally prefer not to eat it by itself but mixing it into the soup greatly enhanced the soup flavour with some added “kick”. 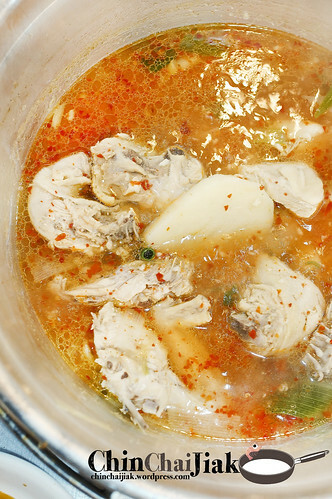 The third way, which is the recommended way, is to throw in the Kimchi (and chilli) to turn it into a spicy and sour chicken soup. For those who love Kimchi, you will love this way of eating cus the Kimchi did wonder to the soup. I’m not sure it’s just me or the soup just magically gets better and better over time and the whole big pot of soup was finished at the end of the meal. Some reviews on the net mentioned that Dakhanmari is only chicken and soup and it’s totally not worth it. From the way i see it, it seems like they chose to enjoy Dakhanmari plainly without the chilli/kimchi and the condiments. So i think it’s rather important to observe and see how others are enjoying it so that we can also have the maximum take-away from each dining experience. At a slightly expensive price of W$20,000 (about S$23.00), that is good enough to serve two, i think it’s worth at least one visit to experience eating something that you can’t find in Singapore, and experience eating like a local at Jinokhwa Halmae Wonjo Dakhanmari. I personally enjoyed it much. Click to enlarge. Take note that this is a very zoom-in map so the distance is not as far as it seems. You can reach this place with just a 5 minutes walk. 1. Exit from Dongdaemum Station Exit 9 and walk straight along the main road. 2. Turn left at this junction as per this photo to walk into a smaller road. 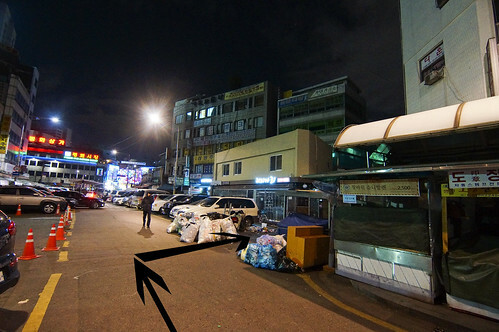 You should be able to see a stretch of food stall on this road. 3. Walk until the end of the stretch of stall as per the photo below and turn right into a small alley. Especially during the night, this alley may looks a little dark but don’t worry, this is the correct one. Walk in a little more and you will be able to see Jinokhwa Halmae Wonjo Dakhanmari. 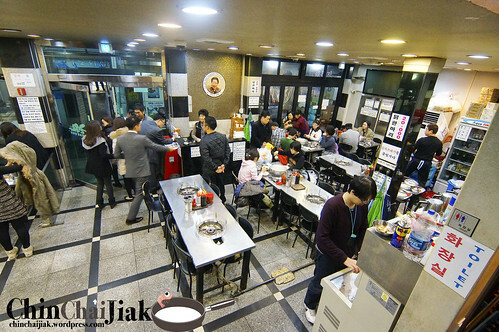 Posted in Dishes - Dakhanmari, Good For - Casual Dining, Location - Dongdaemun, Type - Traditional Korean Food.